Specs: Summit elevation: 9400′; Base elevation: 8400′. 3 Lifts: 2 doubles, 1 surface. Uphill capacity: 1200/hr. Terrain Mix: 20-50-30. Longest Run: 7920′. Season: December to mid-April, Wed-Sun plus holidays. Rentals & Lessons. Annual Snowfall: 200″. The SKInny: Small by western standards, but squarely in the “midsize” pack as overall U.S. ski areas go. Relies on natural snow, so the season sometimes doesn’t kick into full gear until late winter. In 2004, for example, Antelope Butte was not fully open until late February. (2004 was worse-case scenario) Now we’ve listed all the negatives about the Butte, and hope that is enough to prevent the rest of the world from “discovering” this place. Were the general skiing population to learn of a 1,000′ vert with a variety of pitches from pleasant to nasty, free mitey-mite tow for junior, unbelievable powder, $30 top ticket price, zero liftlines, no condos littering the slopes, no phony clocktower village, customer-oriented family ownership…well, this place just might draw a crowd. Seriously, this is one of those ski areas that kind of spoils everything. Once you’ve skied Antelope Butte, the others don’t seem the same. Sure they’re bigger, the lifts are faster, runs are longer…but you’re guaranteed to have fonder memories of a day at Antelope Butte than almost any megaresort. Specs: Summit elevation: 9400′; Base elevation: 8300′. 3 Lifts: 1 triple, 1 double, 1 handle tow. Uphill capacity: 1,000/hr. Terrain Mix: 30-40-30. Longest Run: 7650′. Season: usually late November to late March, Thu-Sun. Rentals & Lessons. Annual Snowfall: 160″. Snowmaking: 55%. The SKInny: Beyond the statistics, Big Horn has its share of extreme skiing, terrific atmosphere, an outstanding lodge, and uncrowded slopes. Formerly a little poma lift hill, a couple of chairs and another 200+ feet of vertical in the late 1990s put Big Horn in a whole different league. For huckers, a series of cliffs right off the summit chair provide some extreme thrills without the need for heavy hiking. The easy summit run, Powder Bowl/Powder River remains a classic cruiser. Other recent improvements include an updated snowmaking system, blowing powder that’s hard to discern from the real thing. This is Big skiing at a mid-sized mountain. Specs: Summit elevation: 10,000′; Base elevation: 7605′. 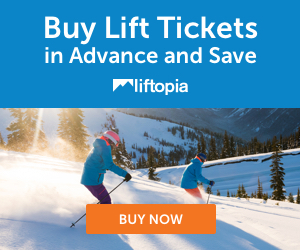 5 Lifts: snowcat, 3 quads, 1 double, 1 magic carpet. Uphill capacity: 7200/hr. Terrain Mix: 10-70-20. Longest Run: 14,675′. Season: usually late November to mid April. Rentals & Lessons. Annual Snowfall: 500″. Snowmaking: 5%. The SKInny: You can start easy, then get as wild and remote as you dare. Roughly 20% of the lift-served terrain (Fred’s Mountain) is groomed. The snowcat area (Peaked Mountain) is completely ungroomed, completely powder, totally incredible. Comparisons to Jackson Hole are inevitable, as GT & JH share the same mountain range. Targhee is on the west side, and receives oodles more snow…and therefore more weather. Not all of it good; a local nickname is Grand Foggy. The locals ski Targhee 9 days out of 10, then shift to Jackson Hole when the forecast is less than promising. (Jackson Hole, on the east side, receives less snow and virtually none of the fog). On days when the weather is good, Targhee beats Jackson for snow quality and shorter liftlines. Some claim Targhee wins on scenery as well. It’s just a much different, less crowded, less commercialized resort, with outstanding skiing. Some will argue the quality of Utah powder…and they’re right, but there are fewer skiers at Targhee, so it stays longer. Some of the runs at Targhee are steep, but not as steep as the couloirs at Jackson Hole. Much more of an intermediate mountain; has a very “open” feel on virtually all of the trails. And when the powder is good, there is none better than Grand Targhee. #1 ski area in the USA when the weather is right. Hotshots, golfcondoskiers and young skiers looking for “action” (I’m over 40, so I don’t remember exactly what that entails) are just about the only people who won’t call Grand Targhee their all-time favorite. For the pure skier, this resort is number one. Signature Trails: Patrol Chute, Crazy Horse. The SKInny: Operated under the auspices of the City of Casper, Hogadon is like a “town tow” on steroids. A serious mountain with good conditions, generally short lines, and a semi-separate poma area with a ten dollar ticket. For added interest, Hogadon is one of the few “upside-down” ski areas (base lodge at the summit) in the Rockies. How can you beat that? Please be aware that the City of Casper sometimes changes their website around, and the link may go kablooie. So if it doesn’t work, just put “Hogadon ski” into the Google. Specs: Summit elevation: 10,450′; Base elevation: 6311′. 11 Lifts: 1 tram, 1 gondie, 6 quads, 1 triple, 1 double, 1 magic carpet. Uphill capacity: 12,100/hr. Terrain Mix: 10-40-40-10. Longest Run: 38,000′. Season: usually early December to early April. Rentals & Lessons. Annual Snowfall: 403″. Snowmaking: 10%. 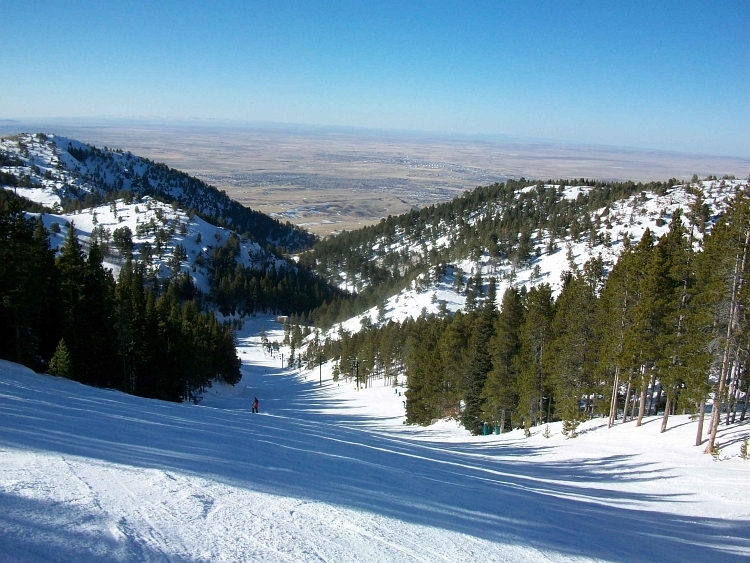 The SKInny: Not the biggest ski area in the USA, but certainly the most imposing. For years Jackson Hole had the longest vertical, but has recently been edged out by Big Sky (MT) and now Snowmass (CO). Regardless of the “official” statistics, Jackson Hole can still be said to have the longest “continuous” vertical drop. More importantly, the pedal-to-the-metal expert will opt for Jackson Hole’s vertical every time. No other ski area in the country has as many lift-served chutes, couloirs, cliffs, and steeps. Once you board the tram, you have reached the top of the U.S. skiing food chain, and 12 minutes later, you’re on top of all of it. You and 60 other fortunate skiers will be staring down the longest and the steepest. And why not, because you already stared down one of the most expensive pricing grids at the ticket window. All in all, it is the ultimate destination for hotshots. But Jackson should not be looked upon as strictly an expert’s area. It is so huge, with so much vertical, that even the most tentative intermediates have plenty to do for at least a week. Beginners and families can start on the green Teewinot area, then move right above it to the mostly-blue Apres-Vouz Mountain. Both of these sections will hold their own against almost any beginner/intermediate area on the planet. It’s a family ski area, as long as the family in question has a sizable line on the Visa card. Last thing to keep in mind are conditions. Jackson can go from powder to crust to slush to crust in less than an hour, depending on the weather. The alternative, of course, is to ride the bus to Grand Targhee. We’re being picky, and if Targhee weren’t just over the hill, we wouldn’t even think of going elsewhere. Jackson Hole is serious, major league. By the third turn you’ll know what we’re talking about. Signature Trails: Rendezvous Bowl, Corbett’s Couloir, Thunder. Sleeping Giant, Cody • 120 skiable acres on 600′ vertical — REOPENED 2009!!! Specs: Summit elevation: 7300′; Base elevation: 6700′. 3 Lifts: 1 double, 1 t-bar, 1 carpet. Uphill capacity: 2000/hr. Terrain Mix: 20-60-20. Longest Run: 4000′. Season: usually late November to mid April, Fri-Sun. Rentals & Lessons. Annual Snowfall: 300″. The SKInny: Small, uncrowded, unspoiled, scenic, terrific. This is Cody, the real Wyoming, with cowboys and oil roughnecks…none of the poseurs, private jets or trappings of Teton Village. The skiing is fantastic; locals organized Sleeping Giant in 1936. While it is a throwback in many ways, the grooming keeps it skiable for everyone. A dynamite little ski area. If you ever have the chance, make a few turns on this hill. Your wallet will breathe a sigh of relief. The SKInny: Mid-sized area, smaller neighbor to Jackson Hole. Looks downright dinky by comparison; would be quite respectable almost anywhere else on earth. As it is, it just might be overall one of the steepest ski areas going. Any Jackson Hole skier should spend a day at Snow King…short lines, cheap prices, walk in from town and jump on a lift that quickly takes you to some downright hairy drops. Fun, excellent ski area. Like its big brother, Snow King has all sorts of hidden trails, unofficial routes, little cut-offs…ideal for the wanderer. Upper Exhibition is one of the ultimate hotshot trails, but they’re all over at Jackson. Even has a couple of hike-to chutes. Sounds scary, but Mom and Dad can also spend a few hours with Junior in the Rafferty chair area, where beginners and emerging blues earn their chops. The SKInny: Located west of Laramie in the Medicine Bow-Routt NF. Pleasant, mid-sized ski area; community of Centennial is growing but not too rapidly. None of the trails are too terribly challenging; the best are intermediate runs. Although smallish by western standards, Snowy Range has plenty of room for wanderers to roam around, and is a great ski area for families, developing intermediates, etc. Low-key atmosphere — hotshots should head elsewhere. Rarely if ever has long liftlines. Specs: Summit elevation: 9500′. 3 Lifts: 2 triples, 1 rope tow. Uphill capacity: 2000/hr. Terrain Mix: 30-40-30. Longest Run: 1600′. Season: usually early December to mid-April. Rentals & Lessons. Annual Snowfall: 250″. The SKInny: Small ski area with outstanding snow conditions, excellent scenery, short lift lines, cheap ticket prices, plenty of trails. It’s fabulous. Only drawback is short runs (for this part of the world) and sometimes nasty road conditions driving up from Pinedale. Despite its small size, wanderers can find plenty to do; hotshots won’t. Ideal for families.